Hose which can be joined as an extension hose using MV00500 or as a replacement for the original hose. Common to all models in the Demon Range except hose reel models. 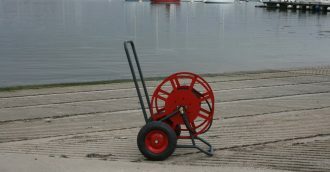 A 30 metre manual hose reel. This retractable hose reel comes with 50ft of hose. The Demon mobile hose reel is a reel that will hold up to 100m of high pressure hose on an easy to move frame with pneumatic 400mm wheels. The new all steel lightweight chassis allows the hose reel to be easily moved over rough ground, and enables the hose to be wound on the reel to maximise life of the hose. Easy wind handle and locking pin for easy use. Standard hose length of 30m.